Chiratta Puttu is a variant of the Kerala Puttu. Puttu (Steamed Rice Cake) is a traditional and important recipe in the Kerala breakfast menu. Soak the rice for about 2 hours (If you are having rice flour / puttu podi, skip directly to step 4). Drain the water from the rice completely and dry it in a cool place and grind it to coarse powder. Clean a half coconut shell (cup shape) and make a hole in its eye’s portion (You can make it easier if you immerse the coconut shell in water for a day). 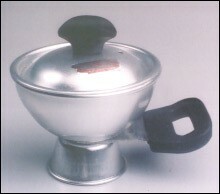 Boil the water in traditional Puttu Maker. Fill a quarter of the coconut shell with coconut scrapings and the balance portion with the flour. Fix the filled coconut shell on the pot’s mouth, when it starts steaming. Spread a wet cloth over the coconut shell to prevent steam escaping through the sides. These days you can buy steel chiratta puttu maker from the market. 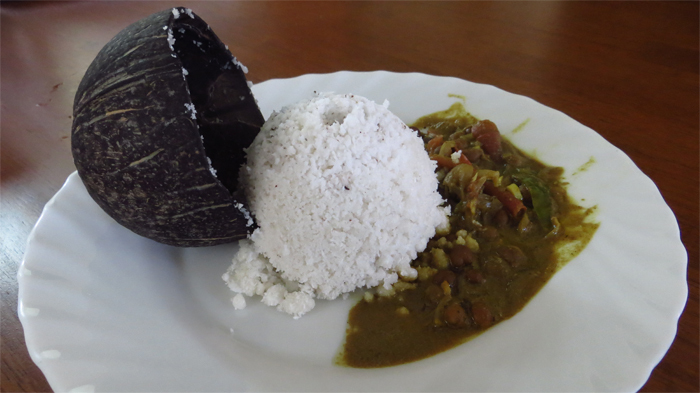 When cooked, remove coconut shell from Puttu Pot and carefully shake the steamed cake on to a plate. Serve hot with Ground nut / Chickpeas (Kadala Curry), Green gram curry (Cheru payar), Cowpea ( Vanpayar ) curry or Mutta ( Egg ) Curry. This entry was added on April 29th, 2013 by Cini P Moideen in Vegan and tagged with kerala puttu recipe, how to make puttu, kerala breakfast, breakfast, kerala puttu, puttu recipe, easy puttu making. Last revised on March 29th, 2018. Recipe & photo contributed by Reshma Anand.